Skills development is vital to solving the scourge of youth unemployment and the IT sector is one of the areas where skills are required. 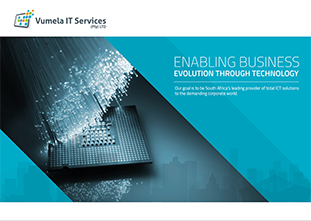 Vumela IT Services recognises that it has a role to play in imparting knowledge to allow school leavers and newly qualified students to begin successful careers and contribute to the economy. Vumela’s Internship Programme empowers young people by providing them with a combination of competencies that will enable them to achieve employment. In addition to hands on experience in IT support, the interns are coached in various skills such as presenting a professional and confident image, corporate etiquette and taking initiative. We also work with our interns to develop a professional CV. Our objective is to produce highly employable candidates who have the technical expertise and experience, as well as the soft skills that will give them the edge in the job market whether employed by us or elsewhere. Vumela IT has developed an intensive programme that provides young graduates with the skills they need to work confidently in any corporate environment. Vumela IT interns are fortunate to be exposed to some of the biggest organisations in South Africa and are trained to strict quality standards. The first phase of the programme is training in how to handle support calls and professionally deal with clients. Software and hardware support training is provided. The training also provides an opportunity for the interns to discover their own strengths, weaknesses and areas of interest. Each intern shadows a Senior Technician, learning from them how to trouble shoot issues and project a professional image. When the intern is ready to start handling support calls directly, they still have access to their mentors who are on hand to offer guidance and advice where needed. The ultimate aim is to produce a fully fledged field technician who is able to handle customer support and deal with calls by themselves in a professional and knowledgeable manner. At the end of the year a ceremony recognises the interns’ achievements and they are presented with a certificate, proving that they have successfully completed the programme. Having completed the internship, the now qualified and experienced technicians are either offered employment by Vumela IT, or are free to pursue other opportunities. At the end of the programme, the graduates are confident in their abilities, are comfortable in a corporate environment and have a CV complete with skills, experience and references which will give them an edge in the employment market. To date, all of our graduate interns have chosen to take up employment with Vumela IT.